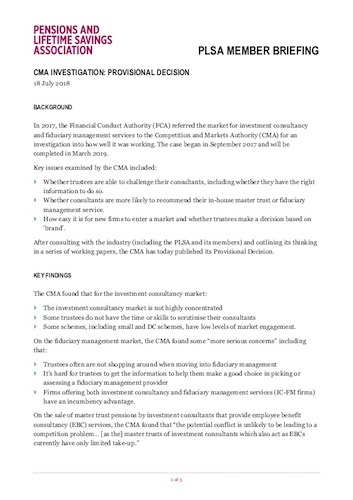 In July 2018 the Competition and Markets Authority (CMA) released its provisional decision report as part of its Investment Consultants Market Investigation. The PLSA has been supportive of the CMA’s work as we seek an efficient and transparent system that works in the interests of pension schemes and savers. The report proposes a series of recommendations to deal with market issues including the information firms make available to trustees, the appointment of firms and regulatory oversight and guidance. We’ve produced this briefing for PLSA members on the issues and remedies. Find all of our work on the CMA’s investigation, including responses to the CMA’s working papers here.